The Partnership is a cross-sector collaboration of organizations and individuals working together to advocate for policies and resources and engage Minnesotans to achieve the goal of fully inclusive, honest and accurate 2020 Census in Minnesota. ACTION ALERT (April 8, 2019) A week ago we were rallying at the State Capitol to get Minnesota revved up for the 2020 Census. One we later we need to jump urgently into action to make sure the Minnesota House's State Government Finance Committee steps up and responds to the call. The committee chair released a budget proposal that recommends $1.6 million for the 2020 Census; $900,000 less than the $2.5 million requested by the Partnership. Click here, right now, and let's get busy at letting Minnesota House members know they need to do better . . because Minnesota is better when we all count! Register now for Census Capitol Lab on April 16. Learn to avigate the State Captiol complex as a seasoned citizen lobbyist! State Funding to Prepare Minnesota for the 2020 Census - The Partnership is asking Minnesota to invest $2.5 million in state funds to beef up the count in Minnesota; especially in historically undercounted communities. Contact Governor Walz and Lt. Governor Flanagan and your state Senator and Representatives and ask "What is the state doing to make sure we get a full count in the 2020 Census?" Also, read Policy in Focus for updates. Action Alert - April 8, 2019. Set Up Local Complete Counte Committees - Counties and local governments should be starting the process of organizing complete count committees for the 2020 Census. These groups are key to getting your community organized and ready for the census. Has your county or local government set up a complete count committee? Call your mayor, city council member or county board member to see what they are doing to gear up for 2020. Learn more about complete count committees and support available to get your community on board. Fully Fund the Census - Congress is short-changing the Census. Important tests are being cancelled, essential communication tools are not getting developed in a timely manner, and staffing levels are well below what is needed. We are calling upon Congress and the Administration to appropriate at least $4.735 billion for fiscal year 2019 so the Census can get on track. Check out MCF's Policy in Focus for ideas and instructions for preparing your comments. Do Not Include a Citizenship Question in the 2020 Census - The Commerce Department recommended adding a citizenship question to the 2020 census. Experts recommend against this. It is likely to result in a less inclusive and less accurate count. Check with The Census Project for more information. Then contact members of Minnesota's Congressional delegation. To get regular federal and state Census policy updates, check out MCF's Policy in Focus. Also, connect on Facebook and Twitter. The Partnership hosts quarterly community meetings to provide updates on 2020 Census implementation in Minnesota, organize participation in state and federal advocacy, and support and mobilize participation in the 2020 count, particularly to engage Minnesota's historically undercounted communities. In 2019 the Partnership will meet on the follow dates. Each meeting is followed by a networking lunch. To reach our goal of a fully-inclusive and accurate Count in 2020 we need to know how to reach those who may be less likely to participate in the Census. Learn about who may be hard to count by state, Congressional district, tribal community, legislative district, county or locality. 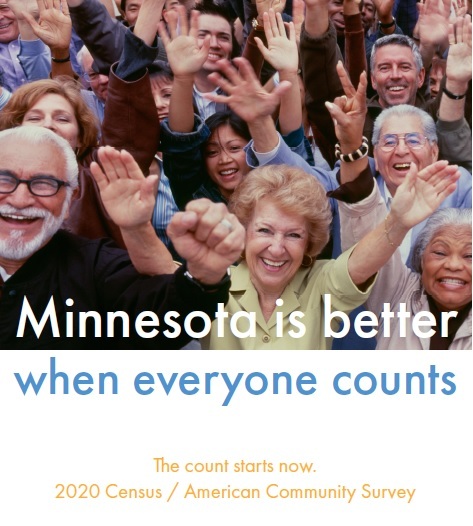 Census Hard to Count Map The Minnesota Census 2020 Communication & Mobilization Plan is tool for any complete count committee and any group working to engage Minnesotans in the 2020 Census, and particularly those Minnesotan's who are historically undercounted. The Census Means Dollars - $900 billion is distributed through federal programs based upon Census data. The Counting for Dollars 2020 Project looks at the connection between the accuracy of the Decennial Census and the geographic distribution of funds. Counting for dollars has issued two reports. The first is an analysis of 55 Census-guided Financial Assistance Programs and projects the per person cost of undercounting. In Minnesota, thats $2,796 per person. The second report documents the actual dollars gained by some states and lost by other due to undercounting. Due the accuracy of Minnesota's 2010 count, the report makes some pretty favorable projections for Minnesota. The Census Means Fair Representation - Just as in 2010, Minnesota is close to losing a congressional seat depending upon the outcome of the 2020 Census count. Read the most recent projection by Election Data Services about Minnesota's prospects for retaining eight congressional districts and see what a different a full count in 2020 can make. Beyond Congressional representation, the census count also has implications for state legislative districts and representation (MinnPost). THE COUNT STARTS NOW. GET LINKED IN. The Case for the Census. Learn about MCF's public policy position in support of the Census/ACS. Community Action. If you just want to get information to stay in the loop or if you want to have a seat at the table to help plan our efforts, joining the Partnership is the step to take. Resources. Useful resources to help you understand what's happening with the Census/ACS; all in one place. The Minnesota Census Mobilization Partnership is convened by Minnesota Council on Foundations, MACS2020, Common Cause Minnesota, Minnesota Council on Nonprofits, Voices for Racial Justices and Asian American Organizing Project. Contact us by email or by phone at 612.338.1989. Return to the MCF public policy home page.